How to do pursed lip breathing. 1. Breath in, inhale, slowly through your nose for 2 counts. 2. Feel your belly get larger as you breathe in. 3. Pucker your lips, as if you were going to whistle or blow out a candle. 4. Breathe out, exhale, slowly through your lips for 4 or more counts. Exhale normally. Do not force air out. 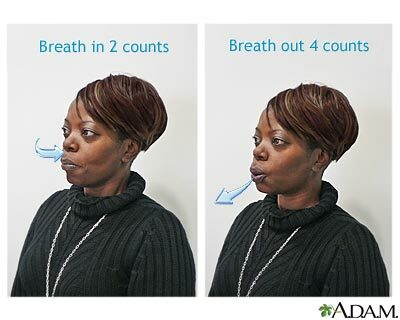 Do not hold your breath when you are doing pursed lip breathing. Repeat these steps until your breathing slows.